How do we know how much oxygen is in diesel engine exhaust? Diesel engine exhaust contains 18 percent oxygen, so a human being cannot die from asphyxiation (lack of oxygen) and exposure to diesel fumes. Rather, the oxygen would actually keep humans alive. A scientific study shows that it is possible to adjust a diesel engine to produce a very low content of oxygen, which in and of itself, outside of carbon monoxide poisoning, would be fatal. The atmosphere at sea level contains about 21 percent oxygen. If the amount of oxygen in the atmosphere dropped to between 10 percent and 14 percent, a human would experience impaired judgment and motor skills. If the amount of oxygen dropped to between 6 percent and 10 percent, a human would experience nausea and vomiting, loss of consciousness, and/or lapse into a coma. If the amount of oxygen dropped below 6 percent, a human would experience convulsions and death. In 1941, two engineers, John C. Holtz and M.A Elliott, conducted a peer-reviewed study where they ran a diesel engine with several different fuel-to-air ratios. They specifically studied the composition of the exhaust under such conditions. Holtz and Elliot were able to produce diesel exhaust that contained less than 1 percent oxygen. They achieved this result by adjusting the fuel pump so it injected more fuel than standard specifications. They also achieved levels with 6 percent carbon monoxide, which in and of itself is lethal. In his falsely “scientific” study of diesel exhaust, Holocaust denier Friedrich Berg actually includes a graph from the Holtz and Elliott study. This chart clearly shows that Holtz and Elliot achieved a rapid drop in oxygen content. Yet, Berg inaccurately insists that diesel exhaust always contains 18 percent oxygen. By Lucignolobrescia – Own work, CC BY-SA 3.0, via Wikimedia Commons. Berg’s claim that diesel engine exhaust always contains 18 percent oxygen is false. The study Berg cites as proof actually shows the exact opposite: if the engine is modified and run slightly outside manufacturer’s specifications, it can easily change this percentage. Berg also ignores the fact that the Nazis were able to kill their victims through a soup of toxic gases. The modified engines not only robbed the atmosphere of oxygen, but also suffocated victims through carbon monoxide poisoning. Berg’s study appears, on the surface, to be based on scientific data. However, he distorts, manipulates and omits evidence to arrive at his foregone conclusion: diesel engine exhaust cannot kill people. 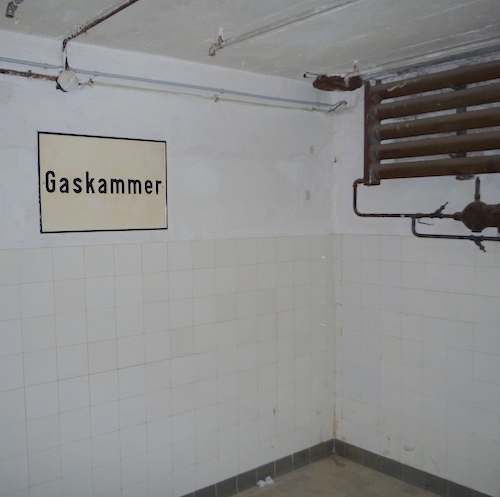 Berg’s study supposedly “proves” that the gas chambers at Auschwitz did not exist. This is junk science. Friedrich Berg, “The Diesel Gas Chambers: Myth within a Myth” (“Carbon Dioxide”) at http://www.ihr.org/jhr/v05/v05p-15_Berg.html. Friedrich Berg, “Pat Buchanan and the Diesel Exhaust Controversy” at www.nazigassings.com/PatBuchanan.htm. Y. Haldane and H.W. Haggard, Noxious Gases (Reinhold Publishing, 1943), pp. 144-45 and J.S. Haldane and J.G. Priestly, Respiration (Yale University Press), pp. 223-24 as cited in Berg, “Diesel Gas Chambers” (“Toxic Effects of Carbon Monoxide”) at http://www.ihr.org/jhr/v05/v05p-15_Berg.html. Friedrich Berg, “Diesel Gas Chambers: Ideal for Torture—Absurd for Murder,” (“6. The Diesel Engine, 6.1 Introduction”) at www.nazigassings.com/dieselgaschambera.html.